As I sing this song this evening, I have a picture of Bartimaeus sitting by the side of the road crying, “Jesus, Master, have mercy on me!” It is so rare that I hear that kind of desperation in people’s prayers today. Especially when praying for others, I tend to hear monotone prayers, with words such as “Lord, be with _____ as he (or she) goes through surgery,” “Save _____,” “Be with us this coming week,” etc. Rarely do I hear people literally crying out to God, “Please save my loved ones. Don’t let them perish. Show me if there is anything I can do or say to help them find you.” Prayer should be more than a daily or weekly ritual; it should be a time when we enter God’s presence and present our petitions, knowing that He hears and expecting that He will answer as we pray in accordance with His will. There are times I pray for a loved one, and I am not sure what God’s will is. This is especially true when a friend has a terminal sickness. I know beyond a shadow of a doubt that God can heal, even from Stage 4 cancer, but I also know He often doesn’t. During these times, I will still pray for healing until I am convinced that that is not His will. Then I pray for strength for the family to walk through the difficult time ahead. God is not obligated to answer every prayer. I know that. But He has told me to ask, so ask I do. And I ask in faith, knowing that He hears me and that He will do what’s best for me and my loved ones. Right now, I have a friend who deals with a lot of pain and sleepless nights. I am praying for His healing but I also know that God’s strength is made perfect through weakness. If God chooses not to heal my friend, He will use the pain to make my friend stronger and draw my friend closer to Him. Although we often refuse to look at it this way, pain with God close by is far better than a youthful body that lives apart from God. In closing tonight, I just want to remind you that Jesus is very near. Present your needs to Him as if He is sitting or standing beside you, because He is. Then, when you’ve presented your requests, take some time to listen. At the very least, you may feel His peace and His presence, but you might even hear His voice as He speaks comfort or gives you direction. Then be sure to thank Him for not passing you by. He is such a good God. I’m so thankful to know Him. 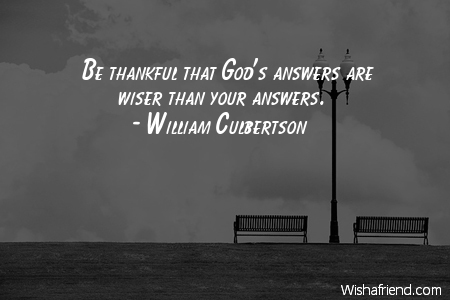 This entry was posted in Encouragement and tagged Comfort, direction, divine healing, draw near to God, Encouragement, God answers, God's strength, God's Will, Healing, pain, Prayer, Thankfulness, William Culbertson, wishafriend.com. Bookmark the permalink. Very well put and thought provoking sister!